Chef Menteur - "We Await Silent Tristero's Empire"
Back Porch Revolution is, or was, based in New Orleans, so we can just hope that they survived the hurricane and incompetence of the US government. 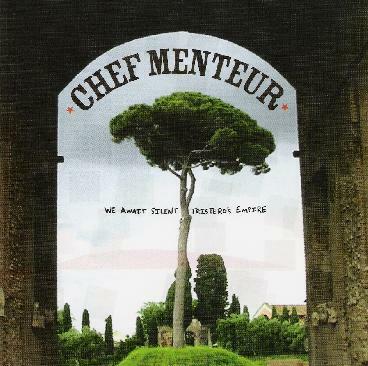 Chef Menteur is an outfit (not sure how many people that is normally but in this case it is 5) who create all instrumental groovy soundscapes with cool catchy bass lines and strange sounds. They play a lot of regular musical instruments (or sample them) as well. Paysans de la Mer features a sitar. This is yet another one of those amazing sound creations that one just has to get into the right state of mind to take the journey. The CD encompasses the instrumental-space rock-soundscape-experimental music genre quite well. While not much of the CD would really be considered rock by anyone, the bass line, which is always very cool, keeps the tracks moving while the sound cacophony takes over your senses and leaves you in another place than you started. For more information you can visit the Chef Menteur web site at: http://www.chefmenteur.org. Visit the Backporch Revolution Records web site at: http://www.backporchrevolution.com.